As a tea-lover myself, one of the most exciting undertaking I had during our last year's trip to Taiwan was to be able to sample their teas, particularly their oolong tea, which I had several tastings of at Jiufen. Taiwan produces some of the finest oolong teas in the world, and the more I learn about the different varieties and subtle differences between them, the more I find myself becoming obsessed with tea. As a side note, Taiwan is also famous with milk teas or bubble teas. 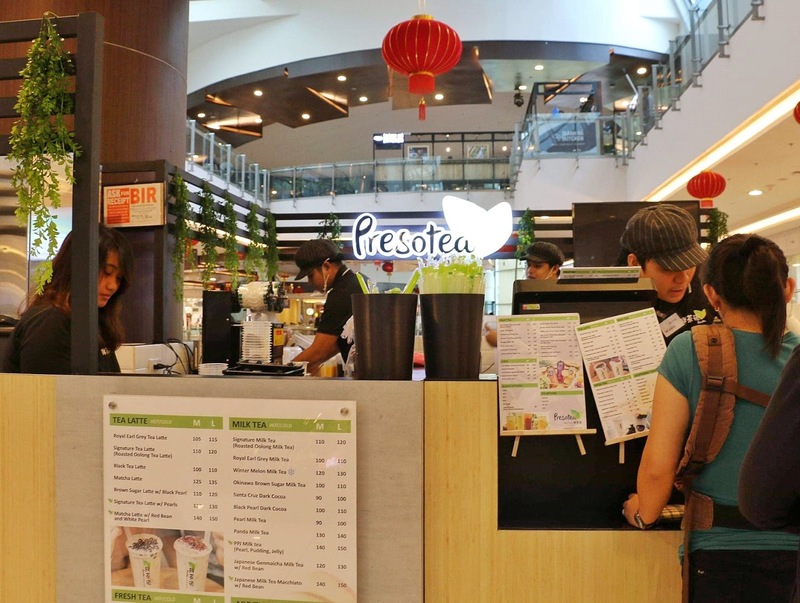 With that said I'm happy to announce the arrival of one of Taiwan's famous milk tea brand - Presotea. 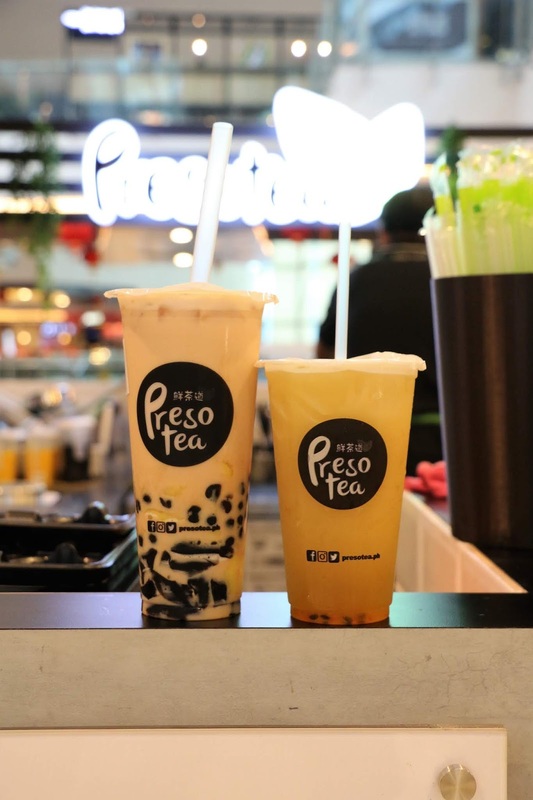 If you think Presotea is just another milk tea brand, think again. 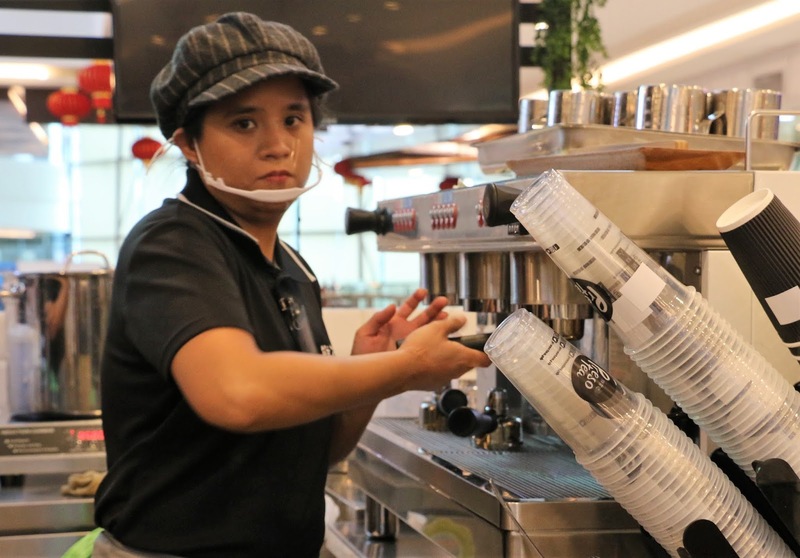 Presotea uses a state of the art brewing-machine called Teapresso. It's basically like an espresso coffee machine but one that presses tea in bags. What's more to like about Presotea is their unique concept, brew-to-order, where one's order needs to use a single tea bag, a single kind of tea (infused or traditionally prepared) for each cup of order, assuring that every customer enjoys freshly brewed each time. Unlike the ones you get commercially where the teas where brewed in heavy masses and distributed in cups depending on taste and flavor preferences of the customers. The teas include: Jasmine Green Tea, Premium Ceylon Tea, Roasted Oolong Tea, Royal Earl Grey Tea, A-Li-Shan, Japanese Genmaicha, Camelia Green Tea, White Peach Tea. 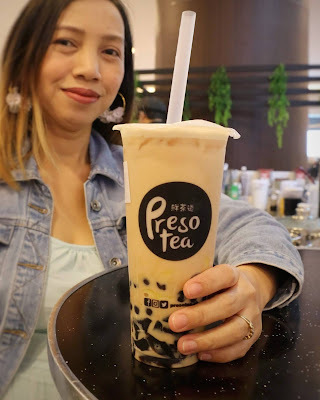 You'll never get tired of drinking milk teas, like me, especially at Presotea, as they have over 30 plus different concoctions of cold to hot tea beverages. I'm sure, if you're a milk tea connoisseur, you might have a favorite selection, or may have tried other brands. But in case you want to try Presotea, which I would definitely encourage you to do so, I urge you to surprise your distinctive tea palate with their fine and refreshing blends. Presotea was brought from Taiwan by the owner of Contours and Glamtatz Semi Permanent Makeup, together with her husband, Dra. Claudine Roura, as a known entrepreneur herself flew to Taiwan to see for herself what this brand of milk tea is all about and why it has grown to more than 300 branches all over the said country and had also gained popularity in other countries such as Japan, Hongkong, Australia, etc. Upon learning and trying the flavors, she was instantly drawn to the tea varieties, she said she couldn't choose which ones she likes the most, as she likes all of them. Knowing how strict and compliant Dra. Claudine is when it comes to the businesses she and her husband manages, I can tell Presotea is a new ballgame. 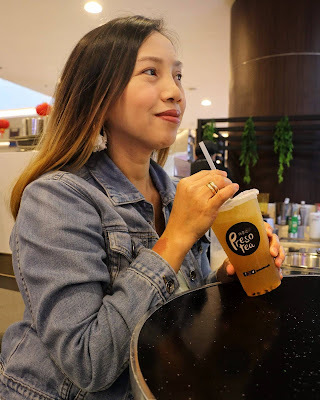 In the launch of Presotea at Robinson's Magnolia last Saturday, I was able to try some of their teas, most of them are uniquely blended in comparison to the ones we have been drinking for years. There are some varieties likely to be compared to others but you can tell the freshness of newly brewed teas with Presotea. You can tell that each cup you order is specially crafted for you. My personal choice is the PPJ Milk Tea (P140 M / P150 L). PPJ stands for Pearl, Pudding, and Jelly, you already get three sinkers in one cup and for the price of one, cause I'm that frugal. I love how all the sinkers were sweetened enough not to overwhelm you but give that right satisfaction. Of course, you can also order your teas according to your sweet preferences you can also have stevia as your sweetener. Let me also recommend, Royal Earl Grey Milk Tea, it's a fine and subtle blend of Earl Grey with milk. I never liked milk before in this kind of tea, but somehow, Presotea made it really refreshing and delish. Wintermelon Tea with Lemon, Green Tea with Double Yakult, Blueberry Aloe Vera Fruit Tea, Plum Green Tea, Passion Fruit Green Tea, and White Peach Fruit Tea. I was able to try the tangy Passion Fruit Green Tea. It's refreshing and has that comforting taste of green tea without the bitterness. For more fruity drink, try the Signature Fruit Tea Fusion. You can tell they are in to fresh varieties as these mixes has fresh fruits in it. Currently, they have opened up two branches and will soon open up more. They are at Cherry Shaw and at Robinsons Magnolia.